On this lazy Sunday afternoon, I decided to check out the cemetery at St. Stephen's Anglican Church off Mt. Newton X Rd. A couple years ago I discovered it was a great place on the Saanich Peninsula to look for Red-breasted Sapsuckers (Sphyrapicus ruber). Just inside the white picket fence, there is a large, exotic conifer that must have been planted in the late 1800s, and it is riddled with sapsucker holes. I usually start by standing at the base of that tree and looking up for some movement or a flash of red. Last week I brought Oskar Nilsson - a Swedish birder that is out for a semester at UBC - out to the cemetery and the scan up the heavily-tapped conifer was fruitless. We walked all around the grounds and saw a lot of bird activity, but came up empty with the sapsucker. Just as I called off the search, a stunning Red-breasted Sapsucker flew right in front of us and tacked itself to the trunk of a small hawthorn! Today, I did the standard check of the large conifer and when that failed I went straight to the same hawthorn. 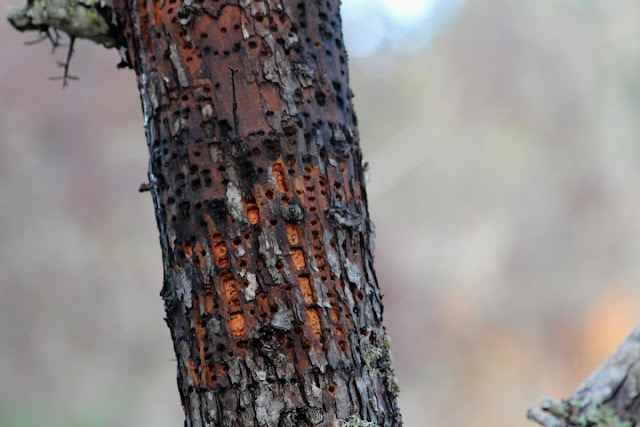 Sure enough, the sapsucker was in the exact same tree near an area that it had actively been tapping. 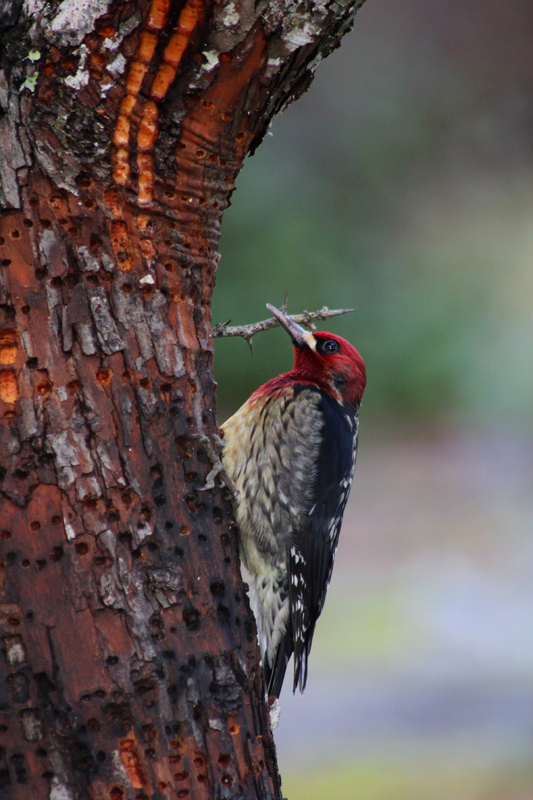 Red-breasted Sapsucker posing nicely by its handy work. 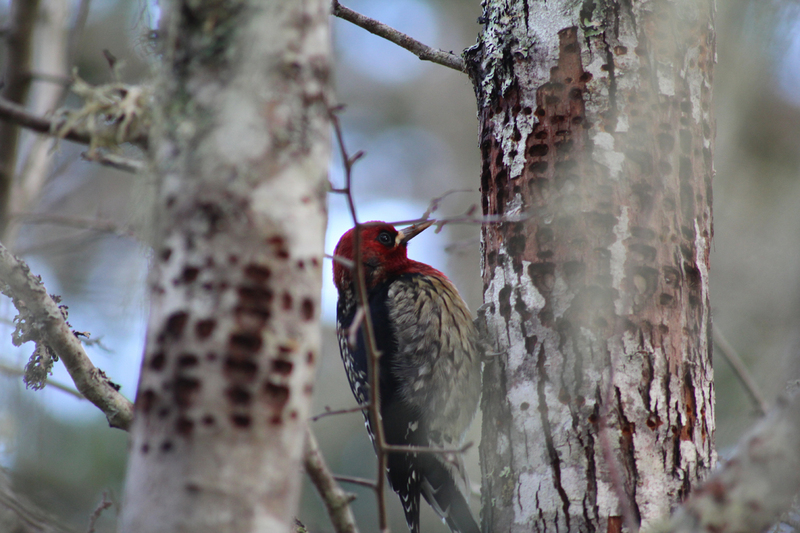 I watched the sapsucker for approximately 15 minutes and they are such a treat to see in action. I was able to crouch a few metres from the hawthorn and observed it as it moved from one area densely packed with sap wells to another. It was not only hard to get good lighting, but also getting a clear view through branches and Usnea lichens wafting in the slight breeze. Here is a close-up view of the sapsucker's intricate network of holes and sap wells. The sapsucker wasn't the only site worth noting. If you have never been to the cemetery at St. Stephen's, you should make the effort to see this historic site. St. Stephen's Anglican Church has been holding services since 1862, which makes it the oldest church in British Columbia running continuously from its original site. 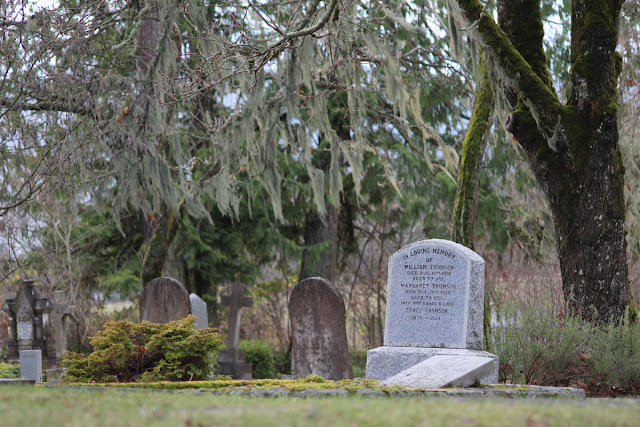 Garry Oaks delicately draped in Usnea lichens looming over weathered gravestones gives the cemetery an ethereal ambiance. This feels like its straying away from natural history, but it really is a beautiful place. You'll understand if you visit, but maybe you can get a sense from the photo I took today. Not your average birding location! Red-booted Sightseer looking for Red-breasted Sapsucker - that's Janean if you don't recognize her field marks. Aside from the target Red-breasted Sapsucker, the birding around the cemetery grounds was pretty good. When I pulled up to the parking lot, there was a big flock of sparrows consisting primarily of Golden-crowned Sparrows (Zonotrichia atricapilla) and Dark-eyed Juncos (Junco hyemalis). Several raptors were sighted over Mount Newton to the north, including a late Turkey Vulture (Cathartes aura) and a Peregrine Falcon (Falco peregrinus). If you are interested in the remainder of the birds sighted during my visit, see my eBird checklist. 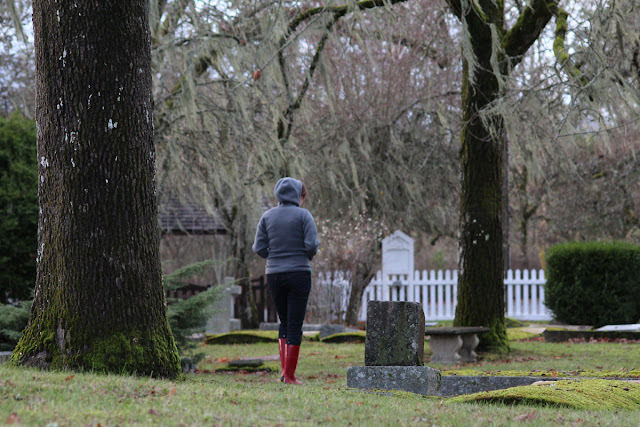 If you find yourself in Central Saanich with some spare time and don't mind feeling a little disrespectful and possibly getting stared at by churchgoers, consider stopping in at the cemetery to have a look around.